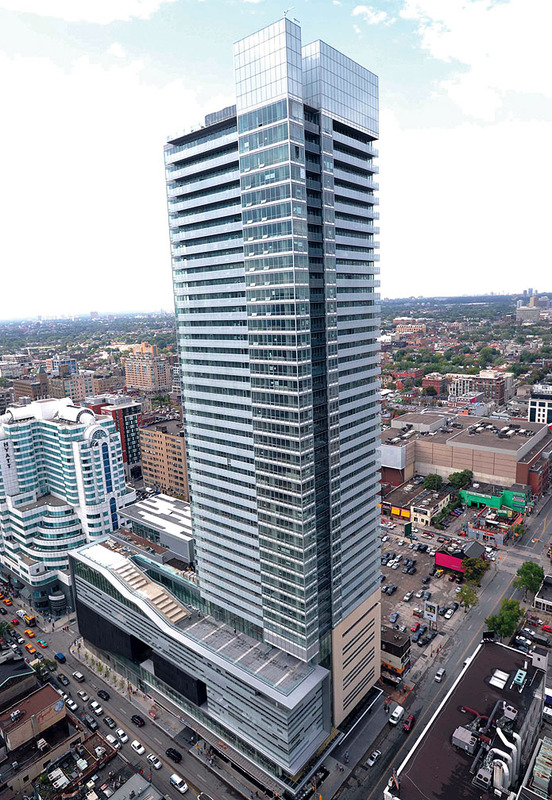 This multi purpose project, located in Toronto, at the north-west corner of King and John Streets is home to the Toronto International Film Festival which has its offices on the fourth, fifth and sixth floors, of the podium component, above a four auditoria cinema complex in the second and third levels. The ground floor and its mezzanine contain galleries, a restaurant and the residential lobby for the forty-two level condominium residential tower with three mechanical levels above the forty-second level residential floor. The sixth floor mezzanine contains a small cinema for the exclusive use of the condominium residence, and the seventh floor, of the podium, serves to house the amenity pavilion, including a swimming pool, gardens, and an amphitheatre as well as a sports lounge. Below the seven storey podium, there are five full levels, and a partial sixth level, of subgrade parking, with resident storage on levels P2 through P5, and bicycle lockers and visitor bicycle parking on the P1 level. At the fourth level, to span over the four auditoria, of the cinema complex, there is a structural steel transfer structure to carry concrete columns supporting the office levels and amenity pavilion above. Typically, the steel transfer system is comprised of pairs of 1400 mm deep welded wide flange composite beams, spanning in the north-south direction, below the lines of the columns above, between the concrete walls of the auditoria. The paired beams carry 410 mm deep wide flange purlins, at approximately two metres on centre which in turn support 200 mm of reinforced concrete over 38 mm deep by 1.219 mm thick steel roof deck for an overall slab thickness of 240 mm. At the sixth floor mezzanine, and the seventh floor levels, there are reinforced concrete beams with depths ranging from 600 mm to 1800 mm to transfer the loads in the shear walls, of the tower above, onto the columns below. From the seventh floor up, the shear walls interact with the central core walls, of the mechanical and elevator shafts, and the scissor stairs to resist lateral forces due to wind and seismic affects. The floors of the tower are typically 200 mm thick and are designed as one-way slabs spanning between shear walls and flat plates where supported by columns. The concrete strength in the walls and columns, at twenty-eight days, ranges from 55 megapascals, below the P1 level, down to 30 megapascals above the thirty-fifth floor. The seating in the auditoria of the cinema complex is installed on floating slabs supported on special isolation pads for acoustical attenuation.